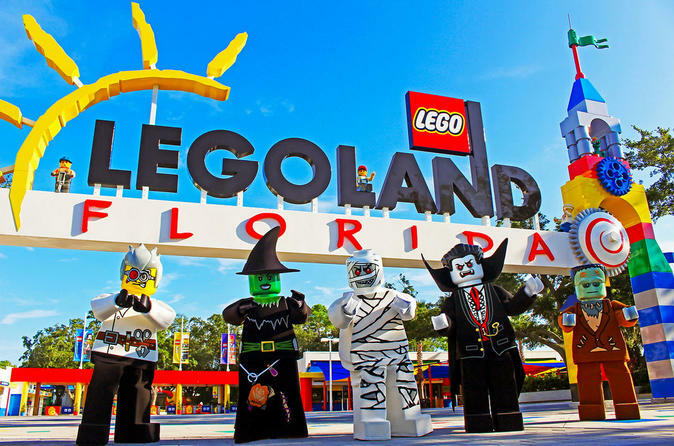 LEGOLAND® Florida Resort is Central Florida's newest theme park! This 150-acre (60-hectare) family theme park located in Winter Haven, just 47 miles (76 km) southwest of Orlando and 56 miles (90 km) east of downtown Tampa. The park offers interactive attractions, family rides, shows, restaurants, shopping and beautiful landscaping, all specifically geared for families with children ages 2 to 12. The annual Brick or Treat event returns with spooky, kooky LEGO® fun for kids, but this year with more days, more entertainment and more candy – and it’s all included in park admission! Welcome to a world where imagination becomes reality! LEGOLAND Florida Resort is the ultimate family theme park, where everyone's imagination runs free. Built for fun with more than 50 rides, shows and attractions that you and your family are sure to enjoy. Hop on Coastersaurus and take a journey through a time-forgotten prehistoric jungle with life-sized animated LEGO brick dinosaurs. Brave the LEGO Technic® Test Track and feel the power of acceleration and braking along a wild roller-coaster track. Or visit Las Vegas, Washington DC, New York and Key West in Miniland USA. Now open is The LEGO® NINJAGO® World. The all-new theme park land is filled with several hands-on activities where you can sharpen your ninja skills before the ultimate showdown on LEGO NINJAGO The Ride. This dazzling attraction blends 3D computer animation, 4D effects and groundbreaking technology never seen outside a LEGOLAND theme park. We hope you've been practicing your cannonball! Get ready to slide, splash and build your way to fun at LEGOLAND® Water Park. From the LEGO® wave pool to the Build-A-Raft lazy river, tube slides, body slides and interactive water-play structures -Joker Soaker and DUPLO® Safari - your kids will soak up tons of fun! Cypress Gardens' beautiful and historic botanical gardens have been restored to pristine condition at LEGOLAND Resort Florida. The collection of native plants, including azaleas and camellias, have been reclaimed and combined with a range of exotic species to create a horticultural masterpiece. Still standing sentinel in the garden is the vast Banyan tree that was planted as a seedling in 1939. Special Offer - Book and save 13% compared to the price of local admission for a 1-day ticket! - Book Now!